This article is about the island country. For other uses, see Aruba (disambiguation). Aruba (/əˈruːbə/ ə-ROO-bə; Dutch: [aːˈrubaː]; Papiamento: [aˈruba]) is an island and a constituent country of the Kingdom of the Netherlands in the southern Caribbean Sea, located about 1,600 kilometres (990 mi) west of the main part of the Lesser Antilles and 29 kilometres (18 mi) north of the coast of Venezuela. It measures 32 kilometres (20 mi) long from its northwestern to its southeastern end and 10 kilometres (6 mi) across at its widest point. Together with Bonaire and Curaçao, Aruba forms a group referred to as the ABC islands. Collectively, Aruba and the other Dutch islands in the Caribbean are often called the Dutch Caribbean. From the Spanish Oro hubo which means "there was gold"
From the Indian[clarification needed] word Oruba which means "well-placed"
Aruba's first inhabitants are thought to have been Caquetío Amerindians from the Arawak tribe, who migrated there from Venezuela to escape attacks by the Caribs. Fragments of the earliest known Indian settlements date back to 1000 AD. As sea currents made canoe travel to other Caribbean islands difficult, Caquetio culture remained more closely associated with that of mainland South America. Europeans first learned of Aruba following the explorations for Spain by Amerigo Vespucci and Alonso de Ojeda in the summer of 1499. Both described Aruba as an "island of giants", remarking on the comparatively large stature of the native Caquetíos compared to Europeans. Gold was not discovered on Aruba for another 300 years. 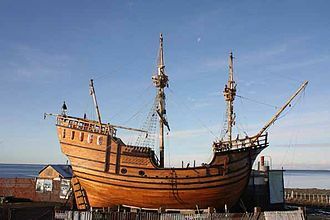 Vespucci returned to Spain with stocks of cotton and brazilwood from the island and described houses built into the ocean. Vespucci and Ojeda's tales spurred interest in Aruba, and Spaniards soon colonized the island. Because it had low rainfall, Aruba was not considered profitable for the plantation system and the economics of the slave trade. Aruba was colonized by Spain for over a century. Simas, the Cacique, or chief, in Aruba, welcomed the first Catholic priests in Aruba, who gave him a wooden cross as a gift. In 1508, the Spanish Crown appointed Alonso de Ojeda as its first Governor of Aruba, as part of Nueva Andalucía. Arawaks spoke the "broken Spanish" which their ancestors had learned on Hispaniola. Another governor appointed by Spain was Juan Martínez de Ampiés. A cédula real decreed in November 1525 gave Ampiés, factor of Española, the right to repopulate Aruba. In 1528, Ampiés was replaced by a representative of the House of Welser of Augsburg. The Netherlands seized Aruba from Spain in 1636 in the course of the Thirty Years' War. Since 1636, Aruba has been under Dutch administration, initially governed by Peter Stuyvesant, later appointed to New Amsterdam (New York City). Stuyvesant was on a special mission in Aruba in November and December 1642. 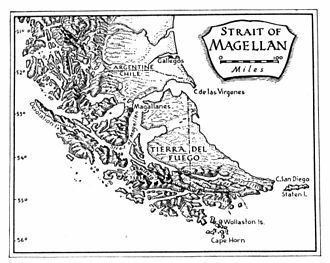 The island was included under the Dutch West India Company (W.I.C.) administration, as "New Netherland and Curaçao", from 1648 to 1664. In 1667 the Dutch administration appointed an Irishman as "Commandeur" in Aruba. The Dutch took control 135 years after the Spanish, leaving the Arawaks to farm and graze livestock, and used the island as a source of meat for other Dutch possessions in the Caribbean. Aruba's proximity to South America resulted in interaction with cultures of the coastal areas more than a century after independence of Netherlands from Spain; architectural similarities can be seen between the 19th-century parts of Oranjestad and the nearby Venezuelan city of Coro in Falcón State. 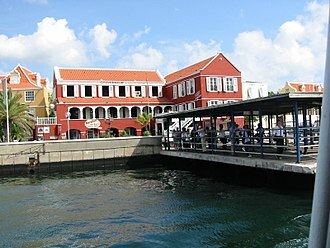 Historically, Dutch was not widely spoken on the island outside of colonial administration; its use increased in the late 19th and early 20th centuries. Students on Curaçao, Aruba, and Bonaire were taught predominantly in Spanish until the late 18th century, when the British took Curaçao, Aruba, and Bonaire. Teaching of Spanish was restored when Dutch rule resumed in 1815. Also, efforts were made to introduce bilingual popular education in Dutch and Papiamentu in the late 19th century. During the Napoleonic wars, the British Empire took control over the island, between 1799 and 1802, and between 1804 and 1816, before handing it back to the Dutch. During World War II with the occupation of the Netherlands in 1940 the oil facilities in Aruba came under the administration of the Dutch government-in-exile in London, and Aruba continued to supply oil to the British and their allies. In August 1947, Aruba presented its first Staatsreglement (constitution), for Aruba's status aparte as an autonomous state within the Kingdom of the Netherlands. By 1954, the Charter of the Kingdom of the Netherlands was established, providing a framework for relations between Aruba and the rest of the Kingdom. In 1972, at a conference in Suriname, Betico Croes (MEP), a politician from Aruba, proposed a sui-generis Dutch Commonwealth of four states: Aruba, the Netherlands, Suriname and the Netherlands Antilles, each to have its own nationality. C. Yarzagaray, a parliamentary member representing the AVP political party, proposed a referendum so that the people of Aruba could choose whether they wanted total independence or Status Aparte as a full autonomous state under the Crown. Croes worked in Aruba to inform and prepare the people of Aruba for independence. In 1976, he appointed a committee that chose the national flag and anthem, introducing them as symbols of Aruba's sovereignty and independence. He set 1981 as a target date for independence. 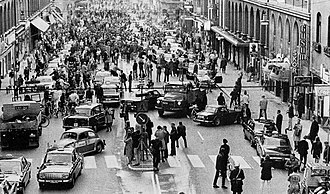 In March 1977, the first Referendum for Self Determination was held with the support of the United Nations; 82% of the participants voted for independence. The Island Government of Aruba assigned the Institute of Social Studies in The Hague to prepare a study for independence; it was titled Aruba en Onafhankelijkheid, achtergronden, modaliteiten en mogelijkheden; een rapport in eerste aanleg (Aruba and independence, backgrounds, modalities and opportunities; a preliminary report) (1978). At the conference in The Hague in 1981, Aruba's independence was set for the year 1991. In March 1983, Aruba reached an official agreement within the Kingdom for its independence, to be developed in a series of steps as the Crown granted increasing autonomy. In August 1985 Aruba drafted a constitution that was unanimously approved. On 1 January 1986, after elections were held for its first parliament, Aruba seceded from the Netherlands Antilles; it officially became a country of the Kingdom of the Netherlands. Full independence was projected in 1996. 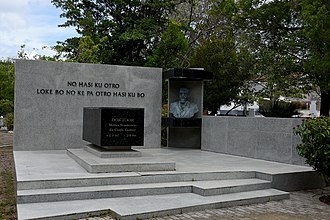 After his death in 1986, Croes was proclaimed Libertador di Aruba. At a convention in The Hague in 1990, at the request of Aruba's Prime Minister, the governments of Aruba, the Netherlands, and the Netherlands Antilles postponed indefinitely its transition to full independence. The article scheduling Aruba's complete independence was rescinded in 1995, although the process could be revived after another referendum. Map of Aruba from the Encyclopaedie van Nederlandsch West-Indië 1914-1917. Aruba is a generally flat, riverless island in the Leeward Antilles island arc of the Lesser Antilles in the southern part of the Caribbean. It has white sandy beaches on the western and southern coasts of the island, relatively sheltered from fierce ocean currents. This is where most tourist development has occurred. The northern and eastern coasts, lacking this protection, are considerably more battered by the sea and have been left largely untouched by humans. The hinterland of the island features some rolling hills, the best known of which are called Hooiberg at 165 meters (541 ft) and Mount Jamanota, the highest on the island at 188 meters (617 ft) above sea level. 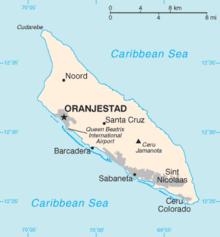 Oranjestad, the capital, is located at 12°31′01″N 70°02′04″W﻿ / ﻿12.51694°N 70.03444°W﻿ / 12.51694; -70.03444. To the east of Aruba are Bonaire and Curaçao, two island territories which once formed the southwest part of the Netherlands Antilles. This group of islands is sometimes called the ABC islands. They are located on the South American continental shelf and therefore geographically listed as part of South America. The Natural Bridge was a large, naturally formed limestone bridge on the island's north shore. It was a popular tourist destination until its collapse in 2005. The island of Aruba, being isolated from the main land of South America, has fostered the evolution of multiple endemic animals. The island provides a habitat for the endemic Aruban Whiptail and Aruba Rattlesnake, as well as an endemic subspecies of Burrowing Owl and Brown-throated Parakeet. The rattlesnake and the owl are printed on the Aruban currency. The flora of Aruba differs from the typical tropical island vegetation. Xeric scrublands are common, with various forms of cacti, thorny shrubs, and evergreens. The most known plant is the Aloe vera, which has a place on the Coat of Arms of Aruba. By the Köppen climate classification, Aruba has a hot semi-arid climate (Köppen BSh). Mean monthly temperature in Oranjestad varies little from 26.7 °C (80.1 °F) to 29.2 °C (84.6 °F), moderated by constant trade winds from the Atlantic Ocean, which come from the north-east. Yearly rainfall barely exceeds 470 millimetres or 18.5 inches in Oranjestad, although it is extremely variable and can range from as little as 150 millimetres or 5.91 inches during strong El Niño years (e.g. 1911/1912, 1930/1931, 1982/1983, 1997/1998) to over 1,000 millimetres or 39.37 inches in La Niña years like 1933/1934, 1970/1971 or 1988/1989. In terms of country of birth, the population is estimated to be 66% Aruban, 9.1% Colombian, 4.3% Dutch, 4.1% Dominican, 3.2% Venezuelan, 2.2% Curaçaoan, 1.5% Haitian, 1.1% Peruvian, 1.1% Chinese, 6.2% other. In terms of ethnic composition, the population is estimated to be 75% mixed European/Amerindian/African, 15% Black and 10% other ethnicities. The Arawak heritage is stronger on Aruba than on most Caribbean islands, and a quite big portion of Arubans who claim their ethnicity as Dutch possess Arawak blood. 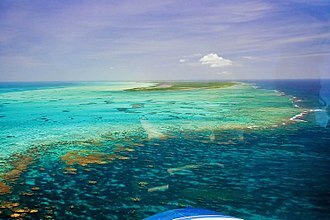 Although no full-blooded Aboriginals remain, the features of the islanders clearly indicate their genetic Arawak heritage. Most of the population is descended from Caquetio Indians and Dutch and to a lesser extent of Africans, Spanish, Portuguese, English, French, and Sephardic Jewish ancestors. Recently, there has been substantial immigration to the island from neighboring American and Caribbean nations, possibly attracted by the higher paid jobs. In 2007, new immigration laws were introduced to help control the growth of the population by restricting foreign workers to a maximum of three years residency on the island. Demographically, Aruba has felt the impact of its proximity to Venezuela. Many of Aruba's families are descended from Venezuelan immigrants. There is a seasonal increase of Venezuelans living in second homes. As Aruba has a little proximity to Colombia, Colombian residents and their children are found here. The official languages are Dutch and Papiamento. However, Dutch is the sole language for all administration and legal matters, Papiamento is the predominant language on Aruba. It is a creole language, spoken on Aruba, Bonaire, and Curaçao, that incorporates words from Portuguese, West African languages, Dutch, and Spanish. English is known by many; its usage has grown due to tourism. Other common languages spoken, based on the size of their community, are Portuguese, Chinese, German, Spanish, and French. In recent years, the government of Aruba has shown an increased interest in acknowledging the cultural and historical importance of its native language. Although spoken Papiamento is fairly similar among the several Papiamento-speaking islands, there is a big difference in written Papiamento. The orthography differs per island, with Aruba using etymological Papiamento, and Curaçao and Bonaire a phonetic Papiamentu. Some are more oriented towards Portuguese and use the equivalent spelling (e.g. "y" instead of "j"), where others are more oriented towards Dutch. The book The Buccaneers of America, first published in 1678, states through eyewitness account that the natives on Aruba spoke Spanish already. Spanish became an important language in the 18th century due to the close economic ties with Spanish colonies in what are now Venezuela and Colombia, and several Venezuelan TV networks are received, and the fact that Aruba has a presence of Venezuelan and Colombian residents. The oldest government official statement written in Papiamento dates from 1803. Around 12.6% of the population today speaks Spanish. Use of English dates to the early 19th century, when the British took Curaçao, Aruba and Bonaire. When Dutch rule resumed in 1815, officials already noted wide use of the language. Aruba has four newspapers published in Papiamento: Diario, Bon Dia, Solo di Pueblo and Awe Mainta; and three in English: Aruba Daily, Aruba Today and The News. Amigoe is a newspaper published in Dutch. Aruba also has 18 radio stations (two AM and 16 FM) and two local television stations (Telearuba, and Channel 22). Aruba is a polyglot society. Most of Aruba's population is able to converse in at least two of the languages of Papiamentu, Dutch, English, and Spanish. Three-quarters of the population is Roman Catholic. As a constituent country of the Kingdom of the Netherlands, Aruba's politics take place within a framework of a 21-member Parliament and an eight-member Cabinet. The governor of Aruba is appointed for a six-year term by the monarch, and the prime minister and deputy prime minister are elected by the Staten (Parliament) for four-year terms. The Staten is made up of 21 members elected by direct, popular vote to serve a four-year term. Aruba is an autonomous country in the Kingdom of the Netherlands, along with the Netherlands, Curaçao and Sint Maarten. Being members of the Kingdom of the Netherlands, they all share the Dutch nationality. However, Aruba is not a sovereign country as certain matters, such as defence and foreign affairs, are handled by the Netherlands. Aruba is designated as a member of the Overseas Countries and Territories (OCT) and is thus officially not a part of the European Union, though Aruba can and does receive support from the European Development Fund. The Aruban legal system is based on the Dutch model. In Aruba, legal jurisdiction lies with the Gerecht in Eerste Aanleg (Court of First Instance) on Aruba, the Gemeenschappelijk Hof van Justitie van Aruba, Curaçao, Sint Maarten en van Bonaire, Sint Eustatius en Saba (Joint Court of Justice of Aruba, Curaçao, Sint Maarten, and of Bonaire, Sint Eustatius and Saba) and the Hoge Raad der Nederlanden (Supreme Court of Justice of the Netherlands). The Korps Politie Aruba (Aruba Police Force) is the island's law enforcement agency and operates district precincts in Oranjestad, Noord, San Nicolaas, and Santa Cruz, where it is headquartered. Deficit spending has been a staple in Aruba's history, and modestly high inflation has been present as well. By 2006, the government's debt had grown to 1.883 billion Aruban florins. Aruba received some development aid from the Dutch government each year through 2009, as part of a deal (signed as "Aruba's Financial Independence") in which the Netherlands gradually reduced its financial help to the island each successive year. In 2006, the Aruban government changed several tax laws to reduce the deficit. Direct taxes have been converted to indirect taxes as proposed by the IMF. A 3% tax has been introduced on sales and services, while income taxes have been lowered and revenue taxes for business reduced by 20%. The government compensated workers with 3.1% for the effect that the B.B.O. would have on the inflation for 2007. Aruba's educational system is patterned after the Dutch system of education. The Government of Aruba finances the public national education system. There are mostly public schools, and there are private schools, including the International School of Aruba and Schakel College. There are two medical schools, Aureus University School of Medicine and Xavier University School of Medicine, as well as its own national university, the University of Aruba. Aruba has one of the highest standards of living in the Caribbean region. There is a low unemployment rate. The GDP per capita for Aruba was estimated to be $28,924 in 2014; among the highest in the Caribbean and the Americas. Its main trading partners are Colombia, the United States, Venezuela, and the Netherlands. The island's economy has been dominated by three main industries: tourism, aloe export, and petroleum refining (The Lago Oil and Transport Company and the Arend Petroleum Maatschappij Shell Co.). Before the "Status Aparte" (a separate completely autonomous country/state within the Kingdom), oil processing was the dominant industry in Aruba despite expansion of the tourism sector. Today, the influence of the oil processing business is minimal[further explanation needed]. The size of the agriculture and manufacturing sectors also remains minimal. Aloe was introduce to Aruba in 1840 but did not become a big export till 1890. Cornelius Eman founded Aruba Aloe Balm and the industry had become very important to the economy. At one point two thirds of the island was covered in Aloe Vera fields and the first plantation covered 150 acres and it is still used today at 127 years old. Aruba had become the largest exporter of aloe in the world, also because of Aruba's climate and dry soil the aloe plants flourished and the aloin content was twenty two percent while the aloin content in the rest of the world was only as high as fifteen percent (arubablog.net) From this Aruba now has its own line of aloe and that contains skin care products, deodorant, sun care, shower and hair products (Aruba aloe). The official exchange rate of the Aruban florin is pegged to the US dollar at 1.79 florins to US$1. Because of this fact, and due to a large number of American tourists, many businesses operate using US dollars instead of florins, especially in the hotel and resort districts. About three quarters of the Aruban gross national product is earned through tourism or related activities. Most tourists are from the United States (predominantly from the north-east US), Canada, the Netherlands and South America, mainly Venezuela and Colombia. As part of the Kingdom of the Netherlands, citizens of the Netherlands can travel with relative ease to Aruba and other islands of the Dutch Antilles. No visas are needed for Dutch citizens, only a passport, and although the currency used in Aruba is different (the Netherlands uses the Euro), money can be easily exchanged at a local bank for Aruban Florins. For the facilitation of the passengers whose destination is the United States, the United States Department of Homeland Security (DHS), U.S. Customs and Border Protection (CBP) full pre-clearance facility in Aruba has been in effect since 1 February 2001 with the expansion in the Queen Beatrix Airport. United States and Aruba have had the agreement since 1986. It began as a USDA and Customs post. Since 2008, Aruba has been the only island to have this service for private flights. Defense on Aruba is the responsibility of the Kingdom of the Netherlands. The Netherlands Military forces that protect Aruba include the Royal Netherlands Navy, the Netherlands Marine Corps and the Netherlands Coastguard. There is also a small indigenous "Arubaanse Militie" (ARUMIL) of about platoon strength. All forces are stationed at Marines Barracks Savaneta. Furthermore, in 1999 the U.S. Department of Defense established a Forward Operating Location (FOL) at the airport. On 18 March, Aruba celebrates its National Day. In 1976, Aruba presented its National Anthem (Aruba Dushi Tera) and Flag. Aruba has a varied culture. According to the Bureau Burgelijke Stand en Bevolkingsregister (BBSB), in 2005 there were ninety-two different nationalities living on the island. Dutch influence can still be seen, as in the celebration of "Sinterklaas" on 5 and 6 December and other national holidays like 27 April, when in Aruba and the rest of the Kingdom of the Netherlands the King's birthday or "Dia di Rey" (Koningsdag) is celebrated. Christmas and New Year's Eve are celebrated with the typical music and songs for gaitas for Christmas and the Dande[clarification needed] for New Year, and ayaca, ponche crema, ham, and other typical foods and drinks. Millions of florins worth of fireworks are burnt at midnight on New Year's Eve. On 25 January, Betico Croes' birthday is celebrated. Dia di San Juan is celebrated on 24 June. Besides Christmas, the religious holy days of the Feast of the Ascension and Good Friday are holidays on the island. The holiday of Carnaval is also an important one in Aruba, as it is in many Caribbean and Latin American countries, and, like Mardi Gras, that goes on for weeks. Its celebration in Aruba started, around the 1950s, influenced by the inhabitants from Venezuela and the nearby islands (Curaçao, St. Vincent, Trinidad, Barbados, St. Maarten and Anguilla) who came to work for the oil refinery. Over the years the Carnival Celebration has changed and now starts from the beginning of January till the Tuesday before Ash Wednesday with a large parade on the last Sunday of the festivities (Sunday before Ash Wednesday). Tourism from the United States has recently increased the visibility of American culture on the island, with such celebrations as Halloween and Thanksgiving Day in November. Aruba's Queen Beatrix International Airport is located near Oranjestad. According to the Aruba Airport Authority, almost 1.7 million travelers used the airport in 2005, 61% of whom were Americans. Aruba has two ports, Barcadera and Playa, which are located in Oranjestad and Barcadera. The Port of Playa services all the cruise-ship lines, including Royal Caribbean, Carnival Cruise Lines, NCL, Holland America Line, Disney Cruise Line and others. Nearly one million tourists enter this port per year. Aruba Ports Authority, owned and operated by the Aruban government, runs these seaports. Arubus is a government-owned bus company. Its buses operate from 3:30 a.m. until 12:30 a.m., 365 days a year. Small private vans also provide transportation services in certain areas such Hotel Area, San Nicolaas, Santa Cruz and Noord. A street car service runs on rails on the Mainstreet. Water-en Energiebedrijf Aruba, N.V. (W.E.B.) produces potable industrial water at the world's third largest desalination plant. Average daily consumption in Aruba is about 37,000 long tons (38,000 t). N.V. Elmar is the sole provider of electricity on the island of Aruba. There are two telecommunications providers: Setar, a government-based company and Digicel, both of which are privately owned. Setar is the provider of services such as internet, video conferencing, GSM wireless technology and land lines. Digicel is Setar's competitor in wireless technology using the GSM platform. ^ Migge, Bettina; Léglise, Isabelle; Bartens, Angela (2010). Creoles in Education: An Appraisal of Current Programs and Projects. Amsterdam: John Benjamins Publishing Company. p. 268. ISBN 978-90-272-5258-6. ^ a b c d "The World Factbook – Central Intelligence Agency". cia.gov. Retrieved 25 August 2017. ^ a b "Aruba". Encyclopædia Britannica. Retrieved 10 August 2014. ^ "History". Visitaruba.com. Retrieved 23 March 2018. ^ Sullivan, Lynne M. (2006). Adventure Guide to Aruba, Bonaire & Curaçao. Edison, NJ: Hunter Publishing, Inc. pp. 57–58. ^ Sauer, Carl Ortwin (1966). 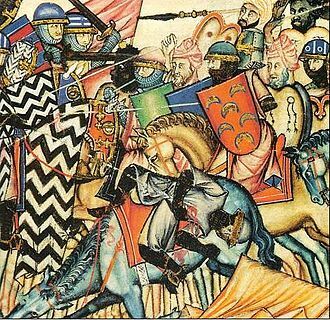 The Early Spanish Main. Cambridge: Cambridge University Press. 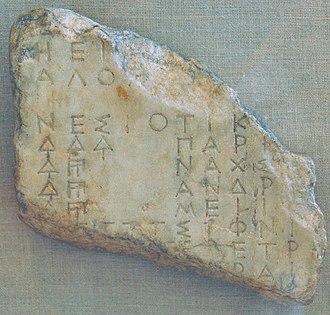 p. 112. ^ "Sitios de Memoria de la Ruta del Esclavo en el Caribe Latino". 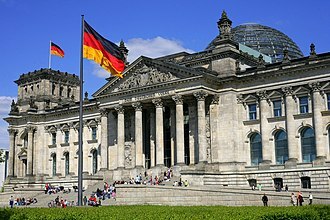 www.lacult.unesco.org. Retrieved 2019-03-04. ^ "British Empire: Caribbean: Aruba". ^ Robbers, Gerhard (2007). Encyclopedia of World Constitutions. 1. New York City: Facts on File, Inc. p. 649. ISBN 0-8160-6078-9. ^ "BBC News — Aruba profile — Timeline". Bbc.co.uk. 5 November 2013. Retrieved 15 July 2014. ^ a b Canoe inc. (22 June 2011). "Aruba: the happy island". Slam.canoe.ca. Retrieved 15 July 2014. ^ "Cities in Aruba - Guide to Aruba's Biggest Cities". Retrieved 2018-06-03. ^ Aruba Central Bureau of Statistics (September 29, 2010). Fifth Population and Housing Census, 2010: Selected Tables (PDF) (Report). pp. 75–76. Retrieved June 3, 2018. ^ a b "Climate Data Aruba". Departamento Meteorologico Aruba. Retrieved 15 October 2012. ^ "About Us". DutchCaribbeanLegalPortal.com. Retrieved 2014-05-20. ^ a b Central Intelligence Agency (2009). "Aruba". The World Factbook. Archived from the original on 4 June 2011. Retrieved 6 June 2011. ^ "Political Stability". Aruba Department of Foreign Affairs. Retrieved 7 June 2011. ^ "EU Relations with Aruba". European Union. Archived from the original on 9 June 2011. Retrieved 6 June 2011. ^ "Overseas Countries and Territories (OCT)". European Union. Retrieved 6 June 2011. ^ "Best Things to do in Aruba - Aruba.com". www.aruba.com. Archived from the original on 15 February 2013. ^ "Korps Politie Aruba: district precincts". Aruba Police Force. Retrieved 11 September 2010. ^ Central Bureau of Statistics. "Key Indicators General Government, 1997–2006". Archived from the original on 22 July 2011. Retrieved 7 June 2011. ^ "Bogaerts: USA TODAY Sports' Minor League Player of Year". Usatoday.com. 3 September 2013. Retrieved 15 July 2014. ^ "Hands for Ziti: Teacher & Students from International School of Aruba Team Up to 3D Print e-NABLE Prosthetics | 3DPrint.com | The Voice of 3D Printing / Additive Manufacturing". 3dprint.com. Retrieved 2018-09-15. ^ "Schakel College in Tilburg • Tilburgers.nl - Nieuws uit Tilburg". Tilburgers.nl - Nieuws uit Tilburg (in Dutch). Retrieved 2018-09-15. ^ "Aureus University School of Medicine". Aureusuniversity.com. Retrieved 25 August 2017. ^ "Caribbean Medical School - Xavier University". Caribbean Medical School - Xavier University. Retrieved 25 August 2017. ^ "Convert Dollars to Aruba Florin | USD to AWG Currency Converter". Currency.me.uk. Retrieved 15 July 2014. ^ "Convert United States Dollar to Aruban Florin | USD to AWG Currency Converter". Themoneyconverter.com. Retrieved 15 July 2014. ^ "The World Factbook — Central Intelligence Agency". Cia.gov. Retrieved 12 October 2016. ^ "Aruba". HighEnd-traveller.com. 2016-05-31. Retrieved 2017-12-08. ^ "Aruba Foreign Affairs". www.arubaforeignaffairs.com. ^ "Aruba Hosts International Desalination Conference 2007". Aruba Tourism Authority. 18 July 2007. Archived from the original on 15 February 2013. Retrieved 13 May 2015. ^ "History". W.E.B. Aruba NV. Archived from the original on 18 July 2011. Retrieved 7 June 2011. ^ "Setar N.V." Setar N.V.
^ "Mio Wireless". Archived from the original on 19 June 2014. ^ "Coral bridge, natural Aruba tourist spot, collapses". USA Today. Associated Press. 2 September 2005. Retrieved 11 September 2010. ^ "Flamingo Beach". Retrieved 5 April 2019. Wikimedia Commons has media related to Aruba. 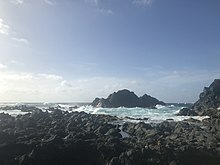 Wikivoyage has a travel guide for Aruba. Aruba is an island in the south of the Caribbean in the Caribbean Sea. It is westernmost island of the ABC Islands and of the Leeward Antilles and it is located at 12°30′N 69°58′W,25 km north of the coast of Venezuela and 68 km northwest of Curaçao. The island has an area of 193 km2 and a coast line of 68.5 km. Mount Jamanota of 188 m is the highest point, Aruba is a constituent country of the Kingdom of the Netherlands. Oranjestad is the largest settlement with a population of 32,748, arubas terrain is mostly flat with a few hills. There is little in the way of vegetation or outstanding physical features, arubas best-known geographical feature is its white-sand beaches, which are the basis of an active tourism industry that is the mainstay of the islands economy. Aruba is situated on the Caribbean Tectonic Plate, Aruba, as well as the rest of the ABC islands and Trinidad and Tobago, lies on the continental shelf of South America, and is thus geologically considered to lie entirely in South America. The core of the island is made up of Turonian submarine and these basalts were intruded by a tonalite pluton shortly after their eruption. The shore areas are mainly limestone-capped hills and ridges, with cliffs on the northern and northeastern coasts, arubas terrain is almost entirely flat. Rock formations characterize the interior of the island, the two most known rock formations are Ayo Rock Formations and Casibari, both are tourist attractions. Along the northern coast it is hilly, especially in the Arikok National Park. The highest elevation, so-called Mount Jamanota, is only 188 m above sea level, while the Hooiberg is not the highest point on the island it does look so because of the flat surroundings it lies in. The Hooiberg can been seen from every point of the island and is so known it has its on place on the Coat of arms of Aruba. 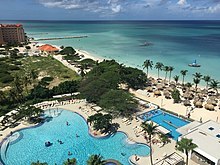 Aruba has three deepwater harbors located at Oranjestad and San Nicolaas, the southern coastal area is known for its white-sand beaches and the calm waters surrounding Aruba are clear, making it a popular tourist destination. The Dutch, occasionally referred to as Netherlanders—a term that is cognate to the Dutch word for Dutch people, Nederlanders—are a Germanic ethnic group native to the Netherlands. They share a culture and speak the Dutch language. The high degree of urbanization characteristic of Dutch society was attained at an early date. During the Republic the first series of large scale Dutch migrations outside of Europe took place, despite the small size of the Netherlands, the Dutch left behind a legacy in excess of their mere numbers. The traditional art and culture of the Dutch encompasses various forms of music, architectural styles and clothing. Internationally, Dutch painters such as Rembrandt and Van Gogh are held in high regard, the dominant religion of the Dutch is Christianity, although in modern times the majority is no longer religious. Significant percentages of the Dutch are adherents of humanism, atheism or individual spirituality, as with all ethnic groups the ethnogenesis of the Dutch has been a lengthy and complex process. The text below hence focuses on the history of the Dutch ethnic group, for Dutch national history, for Dutch colonial history, see the article on the Dutch Empire. Following the end of the period in the West around 500, with large federations settling the decaying Roman Empire. In the Low Countries, this began when the Franks, themselves a union of multiple smaller tribes. 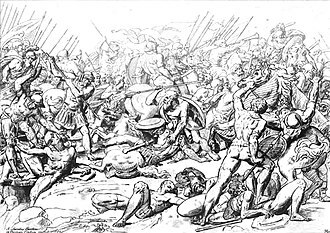 Eventually, in 358, the Salian Franks, one of the three main subdivisions among the Frankish alliance settled the areas Southern lands as foederati, Roman allies in charge of border defense. On a political level, the Frankish warlords abandoned tribalism and founded a number of kingdoms, the population make-up of the Frankish Empire, or even early Frankish kingdoms such as Neustria and Austrasia, was not dominated by Franks. Though the Frankish leaders controlled most of Western Europe, the Franks themselves were confined to the Northwestern part of the Empire, the current Dutch-French language border has remained virtually identical ever since, and could be seen as marking the furthest pale of gallicization among the Franks. Haitians are the inhabitants and citizens of Haiti. A Haitian can be a person abroad to a Haitian parent or a foreigner living in Haiti who acquired Haitian citizenship. According to the Constitution of Haiti, a Haitian citizen is, the Haitian Constitution of 2012 re-legalizes dual citizenship, allowing for Haitians living abroad to own land and run for Haitian political office. The official languages of Haiti are French and Haitian Creole, because the vast majority of Haitians speak only Creole, there have been efforts in recent years to expand its uses. In 1979, a law was passed that permitted Creole to be the language of instruction, however, it was only in 1987 that the Constitution granted official status to Creole. Haitian art, known for its vibrant color work and expressive design, is a tradition, reflecting strong African roots with Indigenous American and European aesthetic. It is an important representation of Haitian culture and history. Haitian art is distinctive, particularly in painting and sculpture where brilliant colors, naive perspective, frequent subjects in Haitian art include big, delectable foods, lush landscapes, market activities, jungle animals, rituals and gods. The music of Haiti combines a range of influences drawn from the many people who have settled on this Caribbean island. It reflects French, African rhythms, Spanish elements and others who have inhabited the island of Hispaniola, youth attend parties at nightclubs called discos, and attend Bal. This term is the French word for ball, as in a formal dance, short for compas direct, is a complex, ever-changing music that arose from African rhythms and European ballroom dancing, mixed with Haitis bourgeois culture. It is a music, with méringue as its basic rhythm. In Creole, it is spelled as konpa dirèk or simply konpa and it is commonly spelled as it is pronounced as kompa. 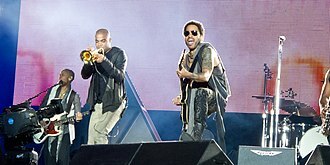 Until 1937, Haiti has had no recorded music, until Jazz Guignard was recorded non-commercially, one of the most popular Haitian artists today, is Wyclef Jean. Wyclef Jean, left the country before his teenage years and his music is somewhat hip-hop mixed with world music. 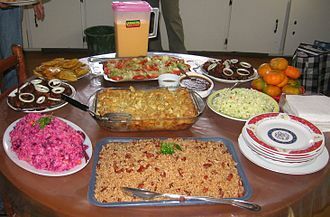 Haitian cuisine originates from several styles from the various historical ethnic groups that populated the western portion of the island of Hispaniola. Venezuelan people are from a multiethnic nation in South America called Venezuela. Venezuelans are predominantly Roman Catholic and speak Spanish, the majority of Venezuelans are the result of a mixture of Europeans and Amerindians. 51. 6% of the population are Mestizos of mixed European and Amerindian ancestry and 43. 6% of Venezuelans consider themselves European or Middle Eastern, an additional 3. 6% identify as Black/African-descendants, while 3. 2% identify as Amerindians. However, archaeological excavations are the evidences that establish certain periods that were taking place on the continent, there are four periods of diversity that develop in the current Venezuela, which entering a new period, it did not mean the end of the previous. The first migrations to the continent were probably from East Asia to 15,000 years and these early migrants came at first to be located in North America, moving to the territory of present Venezuela. Now for their offspring, it was clear verify the Asian features on their faces that will adapt to the climate and lifestyle. 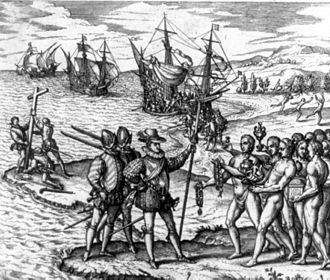 On August 2,1498, Christopher Columbus, and the Spanish colonizers ships, landed for the first time in American mainland and did so in the current Venezuelan territory. Another group of whites who were born in Venezuela were originally called Creole, representing 20% of the population, they were mostly from the Canary Islands, the other two smaller groups were the original inhabitants and indigenous blacks brought from Africa, they were about 5% of the population. This process is responsible for the majority of Venezuelans who are of mestizo mixed race. The country has a population that reflects its rich history. Many of the peoples were absorbed by the mestizo population. Small numbers are descendants of French and Polish, as they emigrated during World War II, black Africans were brought as slaves, mostly coastal lowlands, beginning early in the sixteenth century and continuing into the nineteenth century. 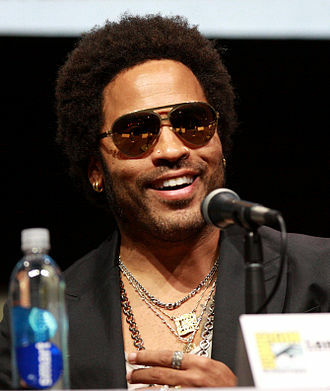 Currently, according to the critic DAmbrosio and other academics, about 51. 6% of Venezuelans are mestizos, 45% are white, 2% are black and 1% Indians. Willem-Alexander is the King of the Netherlands. 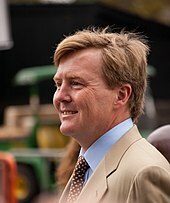 Willem-Alexander was born in Utrecht and is the oldest child of Beatrix of the Netherlands and he became Prince of Orange as heir apparent upon his mothers accession on 30 April 1980, and succeeded her following her abdication on 30 April 2013. He went to primary and secondary schools, served in the Royal Netherlands Navy. He married Máxima Zorreguieta Cerruti in 2002 and they have three daughters, Catharina-Amalia, Princess of Orange, Princess Alexia, and Princess Ariane, Willem-Alexander is interested in sports and international water management issues. At the age of 49, he is currently the second youngest monarch in Europe after Felipe VI of Spain, Willem-Alexander Claus George Ferdinand was born on 27 April 1967 in the University Hospital Utrecht, Now is University Medical Center Utrecht in Utrecht, Netherlands. He is the first child of Princess Beatrix and Prince Claus, and he was the first male Dutch royal baby since the birth of Prince Alexander in 1851, and the first immediate male heir since Alexanders death in 1884. From birth, Willem-Alexander has held the titles Prince of the Netherlands, Prince of Orange-Nassau and he was baptised as a member of the Dutch Reformed Church on 2 September 1967 in Saint Jacobs Church in The Hague. He had two brothers, Prince Friso and Prince Constantijn. He lived with his family at the castle Drakensteyn in the hamlet Lage Vuursche near Baarn from his birth until 1981 and his mother Beatrix became Queen of the Netherlands in 1980, after his grandmother Juliana abdicated. He received the title of Prince of Orange as heir apparent to the throne of the Kingdom of the Netherlands, Willem-Alexander attended Nieuwe Baarnse Elementary School in Baarn from 1973 to 1979. After his military service from 1985 to 1987, Willem-Alexander studied History at Leiden University from 1987 onwards and his final thesis was on the Dutch response to Frances decision under President Charles de Gaulle to leave the NATOs integrated command structure. Willem-Alexander speaks English and German in addition to his native Dutch, between secondary school and his university education, Willem-Alexander performed military service in the Royal Netherlands Navy from August 1985 until January 1987. He received his training at the Royal Netherlands Naval College and the frigates HNLMS Tromp and HNLMS Abraham Crijnssen, in 1988 he received additional training at the ship HNLMS Van Kinsbergen and became a lieutenant. As a reservist for the Royal Netherlands Navy, Willem-Alexander was promoted to Lieutenant Commander in 1995, Commander in 1997, Captain at Sea in 2001, and Commodore in 2005. As a reservist for the Royal Netherlands Army, he was made a Major in 1995, and was promoted to Lieutenant Colonel in 1997, Colonel in 2001, and Brigadier General in 2005. As a reservist for the Royal Netherlands Air Force, he was made Squadron Leader in 1995, as a reservist for the Royal Marechaussee, he was made Brigadier General in 2005. Before his investiture as king in 2013, Willem-Alexander was honorably discharged from the armed forces, the government declared that the head of state cannot be a serving member of the armed forces, since the government itself holds supreme command over the armed forces. The conversion of the Frankish king Clovis to Christianity would have great significance in helping shape the identity of the future Dutch people. The Act of Abjuration, signed on 26 July 1581, was the formal declaration of independence of the Dutch Low Countries. Venezuelans of German descent from Colonia Tovar in Aragua state. Boys from Margarita Island, Nueva Esparta. 66th President Pedro Pablo Kuczynski. 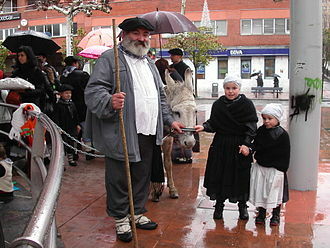 The Dutch Court is still known for their old traditions. The throne of the Ridderzaal, from which the Dutch monarch delivers the Throne Speech on Prinsjesdag. Prince Willem-Alexander and Princess Máxima meet Michelle Obama, Barack Obama and Fay Hartog-Levin at the White House in 2009. King Willem-Alexander of the Netherlands, the reigning monarch of the Kingdom of the Netherlands. At the time this picture was taken he was still the Prince of Orange.